Update 5:04 P.M.: The Pentagon said Wednesday afternoon following publication of this article that it is aware of the Iranian reports, but that "no such interaction has occurred" as it was described. An Iranian naval fleet chased a U.S. warship and military planes through the waters off the southern coast of Yemen late Monday in yet another provocative encounter between the two nations, according to Iranian state media reports. A U.S. warship and several planes reportedly "changed their direction" on Monday after encountering an Iranian naval fleet during a patrol in the Gulf of Aden near Yemen, Iranian state media revealed. The U.S. military assets fled "after they came close to an Iranian naval fleet and were warned to move away," Iran’s state-controlled Fars News Agency reported. Iran also released video of the incident. The run-in between the United States and Iranian militaries is just the latest in several tense confrontations between the countries near Yemen, where Iran is believed to be smuggling weapons to opposition forces. The United States moved military assets in the region in a bid to stop Iran from moving weapons into Yemen. Iranian war fleets have been patrolling international waters around Yemen in recent weeks. Iranian media now claims that the Islamic Republic’s naval fleets chased after two U.S. reconnaissance planes and a Navy destroyer. Two "U.S. reconnaissance planes named P3C [Papa 3 Charlie] and U.S. Navy destroyer, DDG81, approached several Iranian warships in a provocative move, ignoring the internationally set five-mile standard distance from Iran's 34th fleet of warships deployed in the Gulf of Aden," Fars reported on Tuesday. "The U.S. Navy vessel and planes then received a warning from Iranian Destroyer ‘Alborz,’ and rapidly changed direction," the report claimed. Iranian military officials on Tuesday said Iran is prepared to defend itself in the region. "Checking foreign warships in the international waters and surveilling potential threats to Iran’s national interests is our essential responsibility," Commodore Mostafa Tajeddini, the commander of Iran’s 34th flotilla of warships, was quoted as saying on Tuesday. Iran’s 34th fleet will reportedly stay in the Gulf of Aden for three months to conduct "anti-piracy patrols." The fleet is comprised of an Iranian destroyer and helicopter-carrying warship, according to Fars. Iranian military leaders have claimed in recent days that reports of its retreat from the region are inaccurate. Tajeddini said that Iran has not heeded any warnings from the U.S. about its actions in the region. "The news report by the foreign media that we have changed our route after the US fleet's arrival is only a media ballyhoo," he was quoted as saying last week. "We have had communications with many naval units since we entered the Gulf of Aden, but no country has ever dared to warn the Iranian Navy." The Iranian fleet arrived in the region in late April. 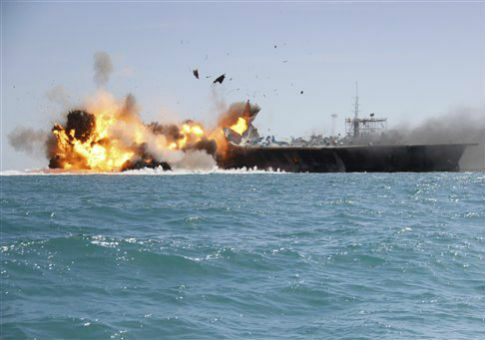 The warships will reportedly "protect [Iran’s] cargo ships and oil tankers against pirates," Fars reported at the time. "This presence [of Iranian warships] continues in the free waters, including the Gulf of Aden, to fight against piracy according to the plan which was drawn at the request of the International Maritime Organization and no one can warn the Iranian warships (to move away) and this has not happened yet," Iranian Navy Commander Rear Admiral Habibollah Sayyari was quoted as saying to the Iranian press at the time. Tensions between the United States and Iran also spiked after the Islamic Republic seized a Marshall Island-flagged merchant ship in the Strait of Hormuz. A U.S. navy destroyer was sent to the area following the incident. A State Department official did not immediately respond to a request for comment about Monday’s reported encounter. Saeed Ghasseminejad, an Iran expert at the Foundation for Defense of Democracies (FDD), said Iran has only been emboldened by ongoing nuclear negotiations with the United States. "Iran’s armed forces, especially the IRGC, have been the main beneficiary of the temporary nuclear agreement," he said. "The Obama administration has given them billions of dollar and a green light to dominate the region. Iran is using the money it receives to expand its missile program, to build new nuclear infrastructures, and to fund the Quds Force’s operations." "The truth is that in order to convince Iran to sign the nuclear agreement United States is literally bribing and strengthening the most radical and dangerous faction in Iran," he said. This entry was posted in National Security and tagged Iran, Navy. Bookmark the permalink.